AKA BAA Sign or BAA Bembo . A typeface designed for Heathrow Airport by Shelley Winter with Freda Sack around 1994. 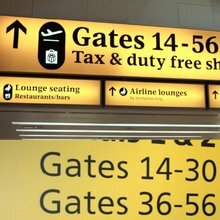 [Alex Dale] Replaced by Frutiger for Heathrow signs around 2006–09.